Aim: This study was designed to compare the accuracy of Root ZX and SybronEndo Mini, electronic apex locators (EALs), in the presence of various irrigants. Materials and Methods: Sixty extracted, single-rooted human teeth were decoronated and the root canals coronally flared. The actual length (AL) was assessed visually and teeth mounted in the gelatin model. The electronic length (EL) measurements were recorded with both EALs in the presence of 0.9% saline; 1% sodium hypochlorite (NaOCl); 2% chlorhexidine digluconate (CHX), and 17% EDTA solution, at "0.5" reading on display. The differences between the EL and AL were compared. Results: The accuracy of EL measurement of Root ZX and Sybron Mini within±0.5 mm of AL was consistently high in the presence of NaOCl and found to be least with EDTA. Conclusion: EL measurements were shorter with 1% NaOCl, whereas longer with 2% CHX for both the devices. Sybron Mini was more accurate with 1% NaOCl and 2% CHX than Root ZX. The Root ZX (J. Morita Mfg Corp., Kyoto, Japan), a dual frequency device, based on the "ratio method", has been investigated extensively as regards its accuracy and its efficacy in the presence of various irrigants. , SybronEndo Mini Apex Locator (SybronEndo, Sybron Dental, Glendora, CA, USA) is multifrequency based and is also claimed to be accurate in the presence of various intracanal conditions, but has not been investigated much. Thus, the purpose of this in vitro study was to compare the time tested Root ZX with the newly introduced SybronEndo Mini Apex Locator in the presence of various intracanal irrigants. Sixty extracted, straight, single-rooted permanent human teeth with mature apices were selected for this study. Teeth were stored in a 0.2% sodium azide solution until use. Residual soft tissue on the root surface was removed by soaking the teeth in 5% sodium hypochlorite (Nice chemicals, India) for 3 h. The type I canal configuration was confirmed by using digital radiograph (Gendex, Dentsply) in mesiodistal and labiolingual planes. Teeth with resorption, curvatures, open apices, or radiographically invisible canals were excluded. The teeth were decoronated at the level of cementoenamel junction with a diamond disc to allow access to the root canal and to provide a stable reference for all measurements. The coronal portion of each canal was preflared using sequential Gates Glidden drills #4, #3, and #2 (Mani Inc., Japan), irrigated with saline and pulp extirpated with a barbed broach (Spirocolorinox, Dentsply). Teeth were numbered 1-60 and the actual length (AL) was determined by introducing a size 10 or 15 k-file (Mani Inc., Japan) into the canal until its tip emerged through the major apical foramen at ×10 magnification under a stereomicroscope (WILD M2Z, Heerbrugg, Switzerland). The long axis of the tooth was placed perpendicular to the line of sight and the tip of the file was positioned tangential to the major apical foramen. , After carefully adjusting the silicone stopper to the reference point, the file was withdrawn from the root canal, and the distance between the file tip and silicone stopper was measured with a digital caliper (Mitutoyo Co., Japan) to the nearest 0.5 mm; 0.5 mm was subtracted from this length and recorded as AL. To simulate the periodontium, this study used the in vitro model as designed by Donnelly. A polystyrene specimen bottle (40 ml) was filled with warmed gelatin solution and refrigerated for 2 h to allow gelatin to set. The apical two-third of the root was embedded in gelatin, and the tooth was stabilized to the lid of a container with auto-polymerizing resin as described by Higa et al. The lip electrode was also placed in gelatin through another opening in the lid [Figure 1]. The irrigants tested were: 0.9% saline (Denis Chem., India), 1% sodium hypochlorite (NaOCl) (Nice chemicals Pvt. Ltd., India), 2% chlorhexidine digluconate (CHX) (Dentochlor, Ammdent, India), and 17% disodium edetate solution (EDTA) (Canalarge, Ammdent, India). The irrigant to be tested was introduced into the canal with a 23-guage needle. Two EALs tested in this experiment were: Root ZX (J. Morita Mfg Corp., Kyoto, Japan) and SybronEndo Mini Apex Locator (Sybron Endo, Sybron Dental, Glendora, CA, USA). Both EALs were used according to manufacturer's instructions. , Depending on the size of the canal, #15 or #20 K-file (Mani Inc., Japan), was attached to the file holder and introduced into the canal. For Root ZX, the meter's 0.5 mm reading was set between the "APEX" and "1" (factory setting) as indicated by a flashing bar and was used for electronic measurements. For each one of the devices, the file was gently inserted into the root canal until the "APEX" signal was displayed. The file was then gently retracted until the display showed a flashing image of the root canal and a flashing bar between APEX and 1 (0.5 reading) for Root ZX and "0.5" blue LED was "on" for Sybron Mini. The silicone stopper on the file was carefully adjusted to a reference point, and the file was withdrawn to measure the distance between the silicone stopper and the file tip to the nearest 0.5 mm. This was recorded as the electronically measured canal length (EL). The canal length was assessed twice by two operators individually for each of the EAL and individual irrigants, amounting to four readings per tooth. To prevent cross-contamination: (a) fresh gelatin was used for the individual irrigant, and (b) the root canals were irrigated with ethanol and dried with paper points. The results obtained (in millimeters) were recorded. The difference between the median of electronically measured length (EL) and the AL were calculated for each tooth for all irrigants, and AL±0.5 mm was used to evaluate the accuracy of the two EALs. The relative conductivity and the pH of irrigants were also determined using a calibrated conductivity meter (Conductivity meter 304, Systronics Ltd, India) and a digital pH meter (Digital pH meter 335, Systronics Ltd, India). A paired t-test was employed to statistically analyze the significance of mean difference between EL and AL. One-way ANOVA was employed to assess the difference among various irrigants in their estimations of the canal length. Significance was set at P<0.05. Inter operator agreement was calculated through the kappa co-efficient range from 0.7 to 0.88 which are highly significant for all the four irrigants for both the apex locators. Hence there is high reliability between two operators. The analysis was performed with Statistical and Presentational System Software (SPSS 16.0, SPSS Inc, Chicago, IL). The mean and standard deviation of actual length (AL) and electronic length (EL) measurements obtained by Root ZX and Sybron mini in the presence of various irrigants are shown in [Table 1]. The mean differences between the electronic and the AL were 0.002 mm and −0.21 mm for Root ZX and Sybron Mini, respectively. ANOVA showed a highly significant difference between the two EALs at P=0.000. The effect of irrigant on the canal length determinations measured with Root ZX and Sybron Mini is as shown in [Table 2]. The measurements of Root ZX in the presence of saline (P=0.209) and 1% NaOCl (P=0.443) were closer to the AL and with no significant difference between them, while significant differences were observed with 2% CHX (P=0.001) and 17% EDTA (P=0.005). Sybron Mini, in the presence of saline, 1% NaOCl and 17% EDTA, gave measurements which were shorter than the AL and the results were significant (P=0.000), whereas, 2% CHX was more accurate (P=0.542) and without significance. Although statistically significant differences existed between the irrigants, the majority of the readings were within the acceptable range of ±0.5 mm for both EALs. The overall accuracy of measurements within ±0.5 mm of AL by Root ZX and Sybron Mini was 88.3% and 87.5%, respectively. The distribution of measurements of Root ZX and Sybron Mini with various irrigants is presented in [Table 3]. The results of conductivity testing of the irrigants ranked from most to least conductive were: 1% NaOCl>17% EDTA>0.9% Saline>2% CHX, and pH from high to low: 1% NaOCl>17% EDTA>0.9% saline>2% CHX. In vivo studies have shown the accuracy of Root ZX to be varying from 82.3% to 96.2% within ±0.5 mm. , The result of our study for Root ZX is in general agreement with a previously reported in vitro study. The overall accuracy of Sybron Mini in this study with various irrigants was 87.5%; however, with NaOCl the accuracy was 93.3% comparable to a previous study of 97.5% accuracy with NaOCl as irrigant. The difference in electroconductivity of various irrigants could be the reason for lowered overall accuracy of Sybron Mini. The literature review revealed that there are no studies evaluating the accuracy of Sybron Mini in the presence of various irrigants. In the presence of saline, the accuracy of Root ZX and Sybron Mini within ±0.5 mm was 95%, which was in agreement with a previous study,  and 88.3%, respectively. Wrbas et al. in an in vivo study with 1% NaOCl found the accuracy of Root ZX within ±0.5 mm to be 75%,  while Weiger et al. in an in vitro study found this to be 95.7% within ±1 mm. de Camargo et al. found the accuracy of Sybron Mini with 1% NaOCl to be 97.5% (−1 ± 0.5 mm from total length, meter reading "1"),  while D'Assunção et al. with 2.5% NaOCl found this to be 100% within ±0.5 mm (meter reading "Apex"). The results of our study with 1% NaOCl with Root ZX and Sybron Mini within ±0.5 mm were 90% and 93.3%, respectively. With 2% CHX in the canals the accuracy of Root ZX and Sybron Mini was 86.7% and 93.3%, respectively, and with 17% EDTA solution this was 81.6% and 75%, respectively. Jenkins et al. found the accuracy of Root ZX was not influenced by 0.12% CHX or 17% EDTA. Kaufman et al. found measurements with 17% EDTA with Root ZX were similar to dry canals or filled with 3% NaOCl or normal saline. There were no studies to compare the accuracy of Sybron Mini with 0.9% saline, 2% CHX, and 17% EDTA. The better performance of Sybron Mini with 1% NaOCl and 2% CHX could possibly be due to its multifrequency mechanism and shorter transmission line. The major limitation of this in vitro study is the length measurements recorded to the nearest 0.5 mm, which is from a statistical point of view gross; since an error tolerance of ±0.5 mm was used to assess the accuracy of the EALs. Better statistical results could have been achieved if the measurements were made to the nearest 0.01 mm. The authors have used 0.5 mm accuracy for the length measurements since this was easy to transfer and reproduce clinically. The results obtained in this in vitro study cannot be applied to the clinical situation, but can provide an objective assessment of a number of variables that are not practical to test clinically. At best the EALs should be used as an adjunct, and not as the only method to determine the canal length in endodontic therapy. Clinicians should exercise caution when interpreting the canal measurements using EALs with different irrigants. Root ZX was more accurate compared to SybronEndo Mini Apex Locator. With 1% NaOCl as irrigant, there was a tendency toward shorter measurement, whereas longer measurements were recorded with 2% CHX for both the devices. SybronEndo Mini was more accurate with 1% NaOCl and 2% CHX than Root ZX. Further, in vivo studies with different irrigants are needed to better evaluate the accuracy of SybronEndo Mini Apex Locator. We express special thanks to Dr. Lancy D'souza for his kind advice in the statistical analysis of the research. 1. Ingle JI, Himel VT, Hawrish CE, Glickman GE. Endodontic cavity preparation. In: Ingle IJ, Bakland LK, editors. Endodontics. 5 th ed. Elsevier India: B.C. Decker; 2003. p. 405-570. 2. Kuttler Y. Microscopic investigation of root apexes. J Am Dent Assoc 1955;50:544-52. 3. Nekoofar MH, Ghandi MM, Hayes SJ, Dummer PM. The fundamental operating principles of electronic root canal length measurement devices. Int Endod J 2006;39:595-609. 4. Gordon MPJ, Chandler NP. Electronic apex locators. Int Endod J 2004;37:425-37. 5. Kim E, Lee SJ. Electronic apex locator. Dent Clin North Am 2004;48:35-54. 6. Sunada I. New method for measuring the length of the root canal. J Dent Res 1962;41:375-87. 7. Jenkins JA, Walker WA, Schindler WG, Flores CM. 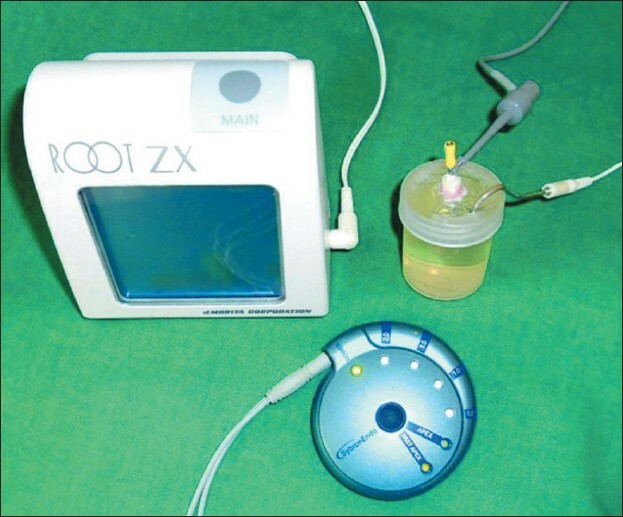 An in vitro evaluation of the accuracy of the Root ZX in the presence of various irrigants. J Endod 2001;27:209-11. 8. Kaufman AY, Keila S, Yoshpe M. Accuracy of a new apex locator: An in vitro study. Int Endod J 2002;35:186-92. 9. Chopra V, Grover S, Prasad SD. In vitro evaluation of the accuracy of two electronic apex locators. J Conserv Dent 2008;11:82-5. 10. Higa RA, Adorno CG, Ebrahim AK, Suda H. Distance from file tip to the major apical foramen in relation to the numeric meter reading on the display of three different electronic apex locators. Int Endod J 2009;42:1065-70. 11. Donnelly JC. A simplified model to demonstrate the operation of electronic root canal measuring devices. J Endod 1993;19:579-80. 12. J. Morita corp. Fully automatic root canal length measuring device. Root ZX operation instructions. 2000:1-9. 13. Mini Apex Locator [Sales manual]. Glendora, CA: Sybron Endo; 2006. p. 1-3. 14. Shabahang S, Goon WW, Gluskin AH. An in vivo evaluation of Root ZX electronic apex locator. J Endod 1996;22:616-18. 15. Kobayashi C, Suda H. New electronic canal measuring device based on the ratio method. J Endod 1994;20:111-4. 16. Czerw RJ, Fulkerson MS, Donelly JC, Walmann JO. In vitro evaluation of the accuracy of several electronic apex locators. J Endod 1995;21:572-5. 17. Dunlap CA, Remeikis NA, BeGole EA, Rauschenberger CR. An in vivo evaluation of an electronic apex locator that uses the ratio method in vital and necrotic canals. J Endod 1998;24:48-50. 18. de Camargo EJ, Zapata RO, Medeiros PL, Bramante CM, Bernardineli N, Garcia RB, et al. Influence of preflaring on the accuracy of length determination with four electronic apex locators. J Endod 2009;35:1300-2. 19. Zehnder M. Root canal irrigants. J Endod 2006;32:389-98. 20. Tinaz AC, Sibel LS, Guliz G, Turkoz EG. The effects of sodium hypochlorite concentrations on accuracy of an apex locating device. J Endod 2002;28:160-2. 21. Vajrabhaya L, Tepmongkol P. Accuracy of apex locator. Endod Dent Traumatol 1997;13:180-2. 22. Wrbas KT, Ziegler AA, Altenburger MJ, Schirrmeister JF. In vivo comparison of working length determination with two electronic apex locators. Int Endod J 2007;40:133-8. 23. Weiger R, John C, Geigle H, Lost C. An in vitro comparison of two modern apex locators. J Endod 1999;25:765-8. 24. D'Assunção FL, de Albuquerque DS, Salazar-Silva JR, de Queiroz Ferreira LC, Bezerra PM. The accuracy of root canal measurements using the Mini Apex Locator and Root ZX-II: An evaluation in vitro. Oral Surg Oral Med Oral Pathol Oral Radiol Endod 2007;104:e50-3. 25. Pilot TF, Pitts DL. Determination of impedances changes at varying frequencies in relation to root canal file position and irrigant. J Endod 1997;23:719-24.
puri, n. and chadha, r. and kumar, p. and puri, k.
KoÃ§ak, S. and KoÃ§ak, M. and Saglam, B.
Joob, B. and Wiwanitkit, V.